Many readers know that I run. I've been running "more" seriously since about 2004 and completed my first marathon in 2005. Since then I've completed eight more marathons along with a few ultramarathons (distances over 26.2). This weekend I'm taking on a 100 mile run. I'll be among the 300 or so runners attempting a solo or relay run of 100 miles, 100k (62 miles) or 38 miles ("fun run") at the Kettle Moraine 100 Endurance Runs, in La Grange, Wisconsin. 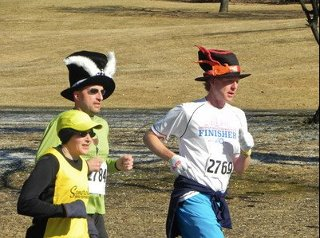 That's me in Somerville Road Runners' black and gold running with the "Mad Hatters" at the Hudson Mohawk Winter Marathon (Albany, NY), one of my training races, this past February. I've got the answers to the most popular questions I've received on the topic of ultramarathons below, for those who are curious. An ultramarathon is any running event longer than a marathon, that is, longer than 26.2 miles. The shortest common distance is 50k, about 31 miles. Other common distances are 50 miles, 100k (62 miles) and 100 miles. The longest ones cover hundreds of miles over days and sometimes weeks. Ultramarathons come in two flavors. Timed events are won by completing the most mileage in a certain amount of time, such as eight hours, 12 hours or 24 hours. Such events are often run on loop courses or tracks. Distance events are won by covering the distance the fastest. While some ultramarathons are run on roads, bike paths or tracks, a majority are run on trails. Some are up mountains or in deserts. Others offer less extreme experiences. One of the popular magazines covering the sport rates each event for both the terrain (flat to super hilly) and surface (paved to lots of rocks and roots). Most events have manned and/or unmanned aid stations that supply water, sports drinks and food. They may be three to ten miles apart depending on the nature of the event. Some aid stations have medical support as well. Some events allow competitors to pack “drop bags” that will be waiting for them at specified locations. These typically contain clothes, lighting, and specialized nutrition. Some events allow runners to bring a crew to support them during the event. Crews drive to specific locations to meet the competitor on the course to supply physical, emotional, medical and other types of support. Crews are often happy to share their supplies and good will with other competitors. Most marathoners drink and many also eat during a run of 26.2 miles. As the events get longer nutrition becomes more important. Some of the choices are the same: water, sports drinks like Gatorade, and gels (engineered nutrition in small squeeze packets). Ultramarathoners add familiar everyday foods including peanut butter and jelly sandwiches, potatoes dipped in salt, pretzels, cookies and candy. Broth and hearty soup are welcome in the cold or during inclement weather. Some events allow and help assign “running buddies,” aka pacers, to those who request them. Some pacers set a pace for a competitor to meet a finishing goal distance or time. Others act as companions (but not sherpas) to help ensure a safe journey. Ultrarunners try to carry only that which is necessary. Some wear backpacks or waist packs fitted with bladders that hold water. Tubes dangling at chest height allow runners to drink with ease while in motion. Some runners carry extra food or clothing in these packs. The fastest competitors typically carry just one or two handheld water bottles. Runners also wear or carry lighting for night running. Some competitors carry music players, too. Most runners stop, if briefly, at one or more aid stations. Some events require a stop to “weigh in” (to check health based on if too much weight is gained or lost) one or more times during a long event. Some runners sit down to rest at aid stations, while other avoid sitting down, fearing they will not get back up. Some competitors in longer events choose to curl up for a “cat nap” at an aid station or along the course. The world marathon record is just over two hours but it’s considered a badge of honor for “regular people” to complete the distance under four hours. The world 100 mile record is 11.5 hours but a "regular people" goal is 24 hours. Those finishing under that time often get a special finishers memento. Training for ultramarathons shares quite a lot with training for marathons. Each week the athlete runs a variety of workouts including one or more long runs. Over the weeks or months the total weekly mileage and the distance of the long run(s) increases. The biggest difference in ultramathon training is that the distances are longer and the long run is often broken up into two back-to-back weekend long runs. A typical marathon training program might take 12-18 weeks. A typical ultramarathon program for 50 miles or more might take 18-30 weeks.